Closed bags don’t get recycled — they get tossed in with the trash at the recycling facility. … too many closed plastic bags! The sensors at City Carting’s sorting facility only work for items that are LOOSE; closed plastic bags are pulled out and thrown away. If you’re going to take the time to separate recyclables, please ensure that they actually get recycled and open/empty all plastic bags!! This announcement is from the Darien Recycling Center on Facebook. Like that page on Facebook and you can get your tips directly, as soon as they come out, and keep informed on other recycling information. Find out more about recycling in Darien here. Can any batteries not be recycled? Which paints are accepted and which types aren’t. You can recycle working markers, pens or pencils. On recycling usable and unusable clothing, shoes, linens and accessories like purses and backpacks. About recycling various types of metal items. What to do with large plastic items. 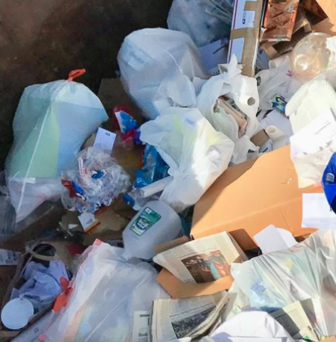 On Tuesdays and Wednesdays, starting April 9, Darien Department of Public Works crews will be picking up bulky items for residents who make appointments on the town website. But you can't get a pickup on April 9 because that date has already been filled up and is no longer available — apparently people who wound their way into the town government website got there before you. The 47th Annual Darien Boy Scouts Giant Tag Sale is scheduled for Sunday, May 5 from 8 a.m. to 4 p.m at the Scout Cabin at 140 West Ave. and we need your donations! Kudos to Best Buy for making recycling so easy! Drop off wires/cords/cables, rechargeable batteries, and plastic bags as you enter the store.